Hey! Been a minute. Poor internet service is to blame. I love how lazy hair days force me to do something nice in five minutes. Is it just me or do those styles usually turn out the best? 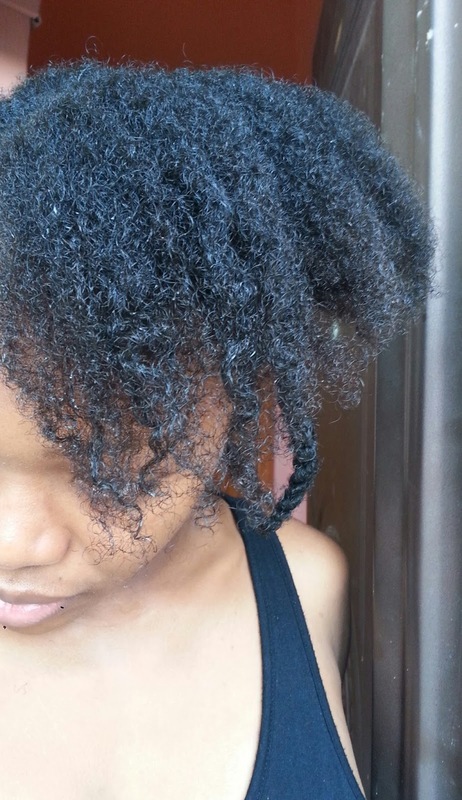 The wash day theme for this week is Lazy Day Hairstyles. Sooo my cup of tea. All my lazy hairstyles involve tucking away and bobby pins. Let's start with the wash itself. My scalp was clean, but my hair wasn't soft. I was back home in Lekki without any of my products, and just the kitchen cabinets to create something. I did my milk and honey treatment. Guys, that was one of my very early posts two years ago. Whoop! I had even forgotten about it until I spotted honey and powdered milk in the cupboard. The recipe is in the link above. I left it on my hair for like 2 hours or so, then I thoroughly rinsed it out. It has zero slip so you can't detangle with it, but once it's out, hair so soft! Curious- It left my curls elongated. My banana deep conditioner does this too. It's temporary. Also, I kept catching faint whiffs of milk from my hair. The next day I did a clay wash to end it. That'll be my next wash day post. If you're using milk in your hair I think it's better to shampoo or co-wash it out instead of just rinsing. 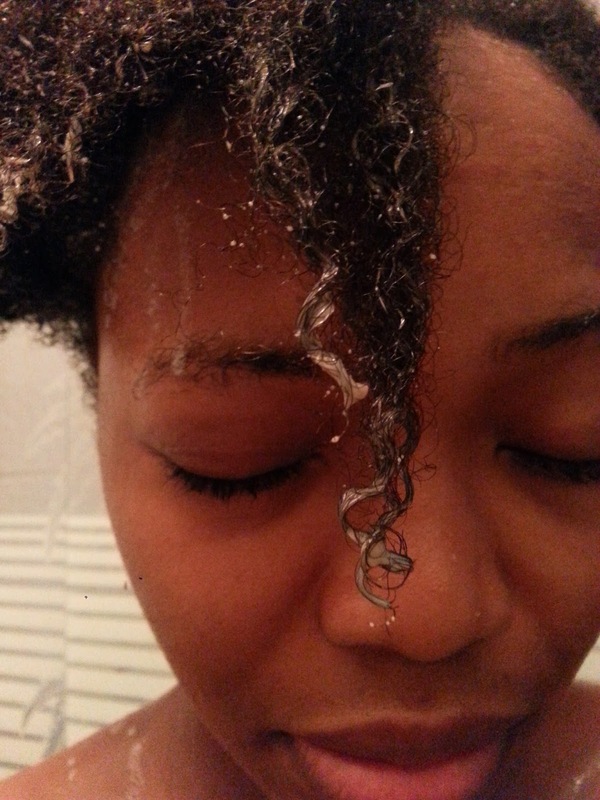 I sealed my damp hair with EV olive oil and stretched with eight bantu knots. 1. It's important to start any sleek style with stretched, properly detangled hair. 2. Use sections in the front, middle and back so at least three. It makes it so much easier and faster. I started with the front section. I pressed it back as sleek as possible, then secured it that way with a piece of hair fron each side like a headband. Bobby pinned the headband in place. Twisted the ends of the front section and tucked into the middle section. For the middle and back sections I just twisted the very ends and tucked in with a bobby pin. That makes the double bun. That's all done in five minutes. 3. Sleek edges: You can take another five minutes if you want sleek edges. I used a bit of Argan oil ecostyler gel (red) over the front section and to lay my edges, then tied it down with my satin scarf while I quickly did my face. Take off the scarf: sleekness. This was all for a themed send-off party. We were all sailors for the day. Fun! * A year and half ago I decided to give up most products with chemicals. 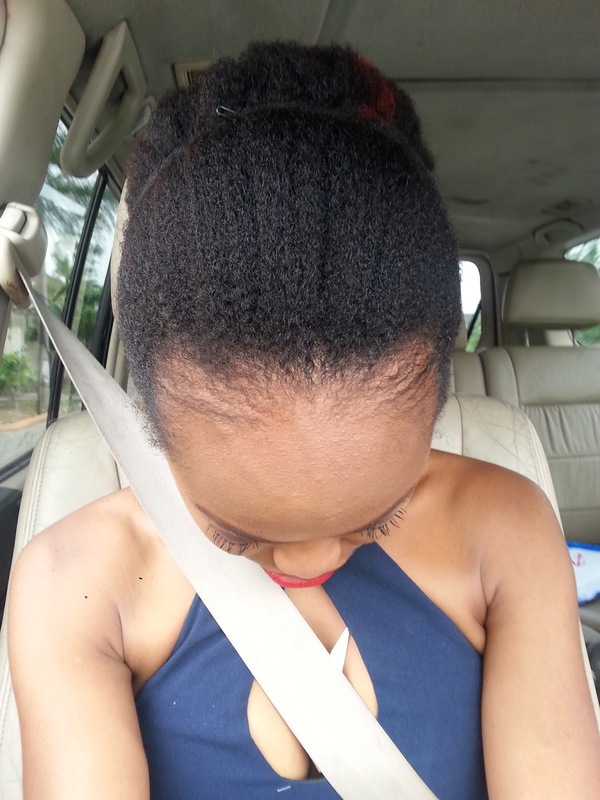 My Ecostyler gel has been in hiding ever since. 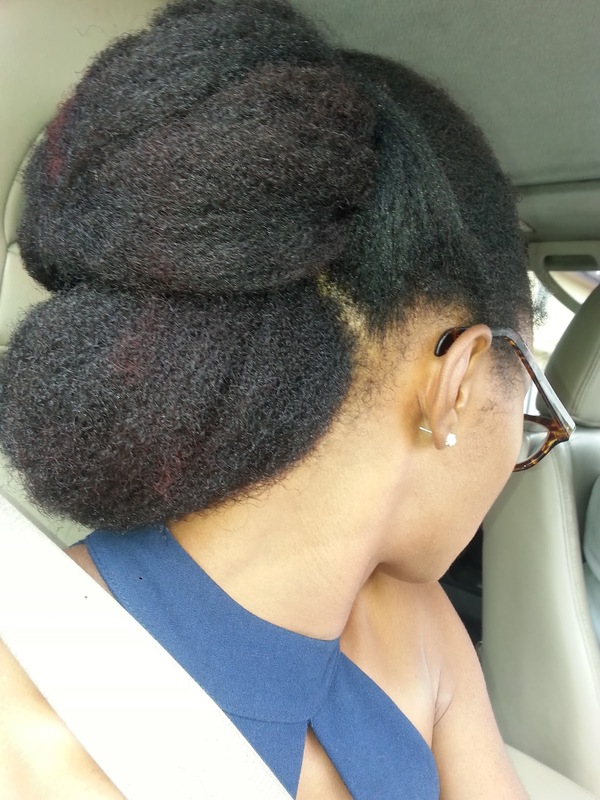 I gave out the gel after this style at the Naturals In the City 14 hair meet-up. It's a journey. 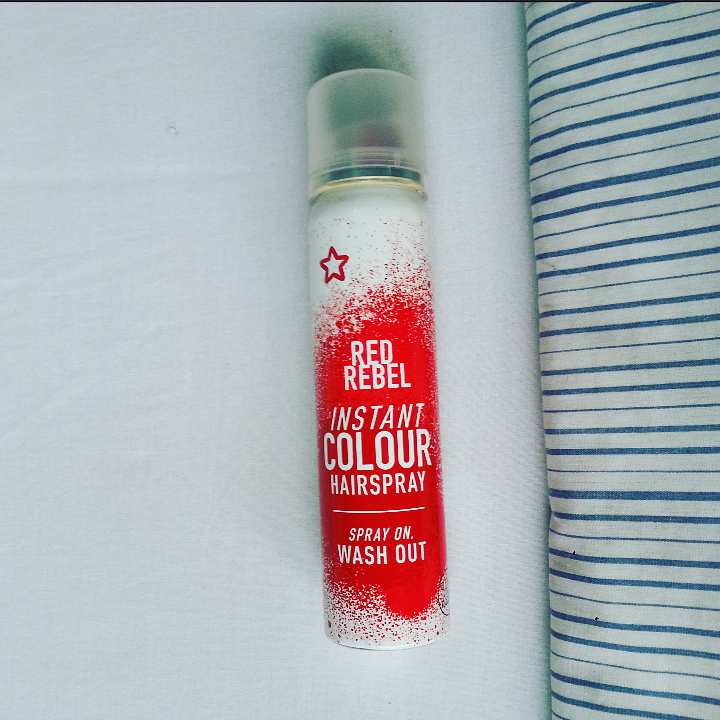 I added a little pizzazz with this red hairspray from Superdrug. I used it tentatively because my look for the day was far from wild. It's great, instantly deposits colour and doesn't transfer half as much as hair chalk does. I'm giving it to my friend Olere who wanted the hair chalk but didn't get it. i can relate andrea. i am a lazy natural. with dense curly hair of head, its so tiring dealing with the hair..
Really it just takes a few bobby pins and hair in sections to make something that looks complex. Natural hair has a way of doing that. awwww... your hair and outfit is so lovely. you are so good with your hair down to styling. good one sandra. me i just need some one that would be doing the hairstyles for me while i sit and sleep is that too much too ask ehn, lol.. I LOVE that pop of color! When I use hair chalk---I seal it with a little hair spray to keep it from transferring! cute hairstyle. And nice one there with the honey and milk. I should try it soon. I'd love to read your take on it Bee. I love the look but probably wouldn't be a lazy style for me. It's so easy I promise, the finished look belies it. That's why I love pin and tuck styles. I love this hair do I am just going to have to recreate it. 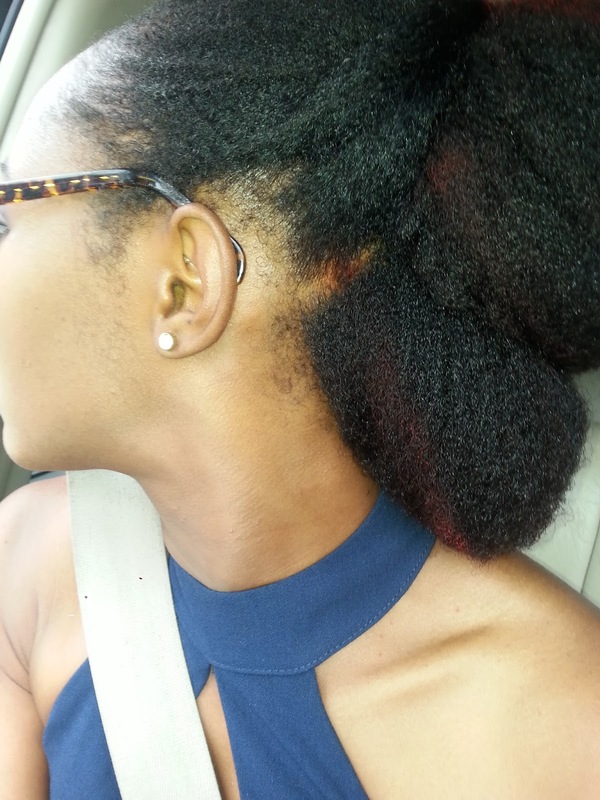 Thanks Wura, I love what you do with your hair too. Yvette! You were my transition twin. Please share when you do, I want to see how it goes. I hope the hairstyle is as easy as you described, my hairstyling talent is not something I'm very proud of lol. Love the style. Your hair looks so nice, Sandra. I'm looking forward to your clay wash results. I plan to try one soon. I've done it a few times before with bentonite clay. I'll share the link(s) when I post on my new romance with rhassoul clay. Your outfit is so lovely. Errem does baby milk count? I don't know if they'll work the same but baby stuff is more expensive anyway, and you probably want to remain in the baby's good books. Love the outfit, so chic. I'm just going to carry my jealousy of your hair to another place. Honey and milk?!! Have to try that! !